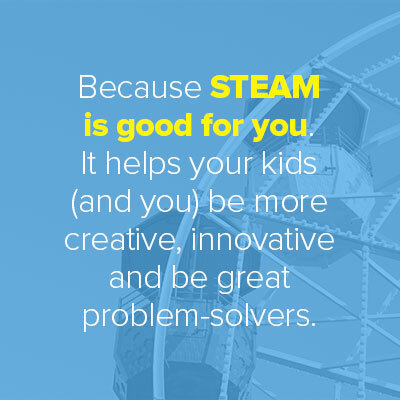 The challenge is to find STEAM in everyday life for 21 days this summer. This could be for a family, a camp, or a classroom. Sign up here and you will receive 3 simple, no kit-required, ideas for STEAM activities for 21 days. These activities are fun for all ages. STEAM diet in their daily life? What better time than the summer to practice living a learning lifestyle. It’s good for the kids, it’s free, and it’s fun! Sign up to explore the world around you in fresh, new ways wherever you are – at home or on vacation. Once you sign up, the blank calendar you will receive will be a useful way your students can keep track of their STEAM challenge. You can have them do the STEAM activities at home or at camp. Feel free to make copies of and distribute the calendar to students so they can complete daily. Make it fun and have them share what they did each day. This can be a great motivation for kids! If you only teach a week-long or a 2-week-long camp, make it a 7-day or a 14-day challenge! Don't forget to share what you do on social media. Use #21STEAMChallenge. We'd love to hear from you!